N E E D A D E S I G N ? Design Works employs a student staff of award winning designers. Designers are available for brochures, logos, flyers, scans, and basic setups. Designers meet with customers throughout the design process to ensure customer satisfaction. For pricing, please reference price sheets below or contact the Design Works Office. DESIGN WORKS processes jobs as fast as possible to get the finished product to our customers. A three day turn around on print or shop jobs can be expected during our busier times. We cannot print copy-written images. Have a custom or unique print job? Call ahead and we can provide a time and price estimate! Our printers are HP Design Jets - 600dpi capability. We print with UV ink. Design Works has several different options for large format printing. *Samples of each paper are available at the Design Works office. Large format printing is charged by the square inch. Setting up the print job yourself? Design Works is not responsible for spelling errors or color matching from outside files. A one inch color test strip is recommended. Design Works can print from many different graphics and word processing programs - please call ahead to check on compatibility. Remember files downloaded from the web, when enlarged, will become fuzzy or blurred. We do not recommend their use in large format printing. Design Works's turnaround time depends on work load. Design Works requires at least one week (five working days) on large print orders or print order requiring setup. Please let us know when you need the job done when you are placing the order. We have 11" latex balloons in the primary (red, yellow, blue) and secondary (green, orange, purple) colors - also available in black, white, lime green and pastel colors (please call for pastel color availability). Latex balloons have a life span of 8-12 hours. We have mylar balloons containing various designs for special occasions (birthday, get well, congratulations, we'll miss you, good luck, we appreciate you, I love you, etc.). We also have mylar balloons in several solid colors (please call for availability). Mylar balloons have a life span of 2-4 days. We have a selection of specialty mylar balloons that have various designs and shapes. Please come by Design Works office to see different balloon choices. 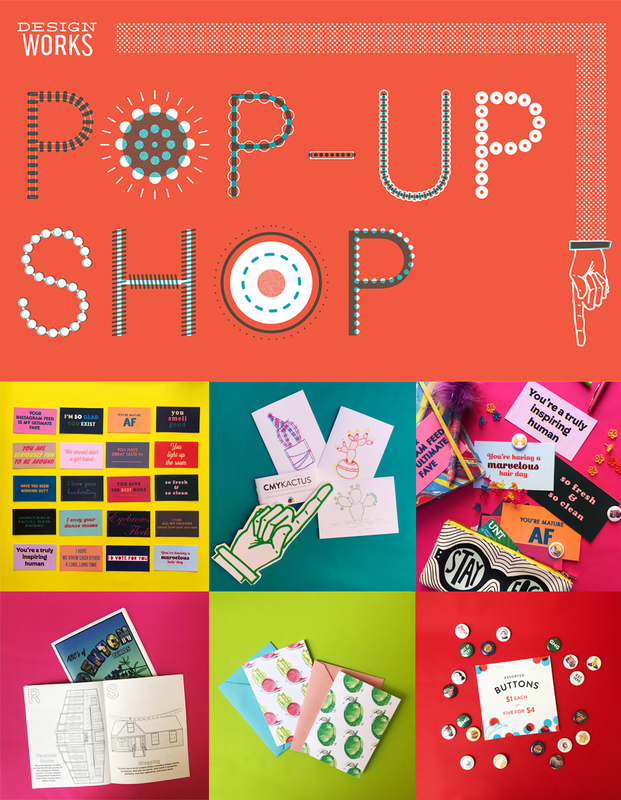 Check out our pop-up shop at the front of Design Works! We have buttons, greeting cards, a Denton-themed coloring book, compliment cards, and more. Follow Design Works on Instagram to see more of our handmade products and find out what our designers and shop assistants are up to during the week! Waterproof, adhesive but adjustable, up to 35 inches wide. Not recommended for long-term outdoor use. Banners are printed from our large format 600 dpi printers. The typical banner size is 8' x 3'. The price of one banner includes 3 grommets; additional grommets may be added for an extra charge. Lawn signs are available from Design Works. The lawn sign will be 12"x18", double sided, laminated, and will include metal frame. Design Works uses a heat press laminate that has the ability to laminate thicker signage. Laminating with the manual press can be single or double sided. Maximum size is 32"x40". The roll laminating machine can laminate only double sided up to 3' wide. The roll laminate does have a tendency to crease or wrinkle larger items pieces, please order at your own risk. Drymount is a heat process using a permanent bonding tissue. Drymount can also be used with matboard, or foamboard. Maximum size is 32" x 40". Posterboard — Thin board in variety of colors. Maximum size is 22"x28". Matboard — Thicker, stronger board in variety of colors. Maximum size is 32"x40". Foamboard — Strong board with foam center - white only. Maximum size is 40"x60". Samples of each board and colors are available in Design Works office. Design Works sends and receives public faxes for the Union. There are different prices for faxes, depending upon if the fax is sent locally, toll free, long distance, out of the country, or if it is an incoming fax. For pricing, please call our office at (940)565-3829. Our fax machine is on 24 hours a day so incoming faxes may be sent at any time. The Design Works fax number is (940)369-8772.